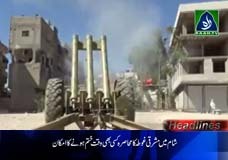 Eastern Ghoota’s seige is likely to end up, Mujahideen are prepare for relief activities in Syria. 100 days completed of "Rabia” incident in Egypt. Memorandum submitted in American consulate to stop drone strikes in Khyber Pakhtunkha.